The Drive Medical Adjustable Forearm Platforms and Mounting Brackets are designed to be compatible with the Adult Anterior Safety Rollers by Drive. 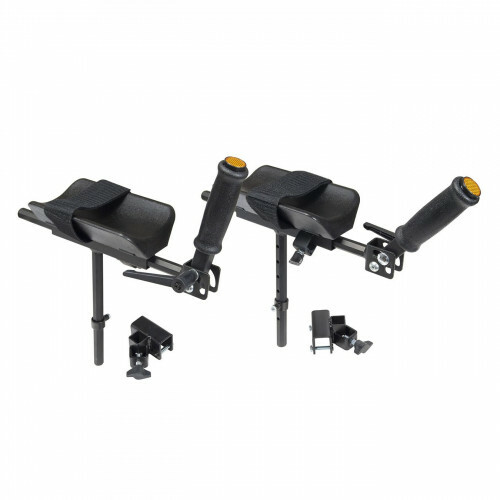 They are easy-to-attach, are height and depth adjustable, and can rotate inward and outward. The Drive CE 1035 FP Forearm Platform Supports are designed with handgrips that can be extended backward and forward and are angle adjustable to provide a comfortable grip. The armrests are contoured and molded into one piece that has a flexible edge. It comes with hook and loop fastener straps that prevent the arms from sliding. It can be mounted anywhere along the handlebar and positioned according to the patient's weight bearing needs. It is lateral adjustable and each side can be adjusted individually.